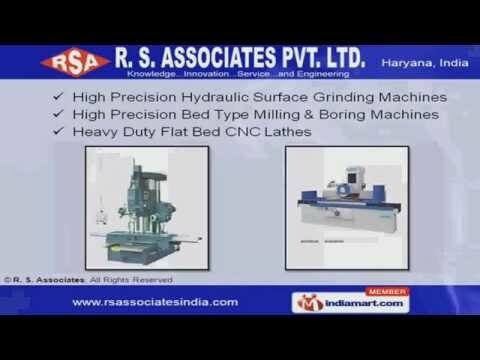 Welcome to R. S. Associates Private Limited, Supplier of Industrial Machines. The company was established in the year 2006 at Faridabad. Our 24X7 helpline support, specialized R&D wing & wide distribution network make us unique in the industry. Assured quality, well testing equipments, Competitive prices & Timely delivery schedule make us stand apart from also-rans. Our Vertical Turret Milling Machines, High Precision Vertical Machining Centers & All Geared Lathe Machines come with features like durability & reliability. We provide premium grade Heavy Duty Milling, Electric Discharge & High Precision Radial Drilling Machines. Along with that we offer High Precision Hydraulic Surface Grinding, Bed Type Milling & Boring Machines. Our Slant Bed Turning & Vertical Maching Centers are well known in the industry for their impeccable performance. We also offer Double Column CNC Machining Centers, Plastic Injection Moulding Machines & Moulding Machine Control Devices. Our Hooper Dryers & Manual Surface Grinders are a class apart.